Offsite grid power has been brought to the Daiichi site, and is in the process of connection to each reactors equipment. Progress has been achieved in restoring external power to the nuclear power plant, although it remains uncertain when full power will be available to all reactors. Off-site electrical power has been connected to an auxiliary transformer and distribution panels at Unit 2. Work continues toward energizing specific equipment within Unit 2. Radiation levels near Fukushima Daiichi and beyond have elevated since the reactor damage began. However, dose rates in Tokyo and other areas outside the 30-kilometre zone remain below levels which would require any protective action. In other words they are not dangerous to human health. In the associated WNN report, is the following IAEA graph of unit 5, 6 fuel pond temperatures. External power for units 3 and 4 should be in place ‘in a few days’ time’, said Tepco. (…) Despite contradictory comments by the US Nuclear Regulatory Commission to US politicians and media, most observers in nuclear industry and regulation consider the measures taken by Japanese authorities to be prudent and appropriate. ・TEPCO planned an operation to release air containing radioactive nuclidesinside the containment vessel at unit-3, give a situation of pressure increaseinside the containment in this morning . However, TEPCO decided not to releaseit since the pressure becomes stable later. 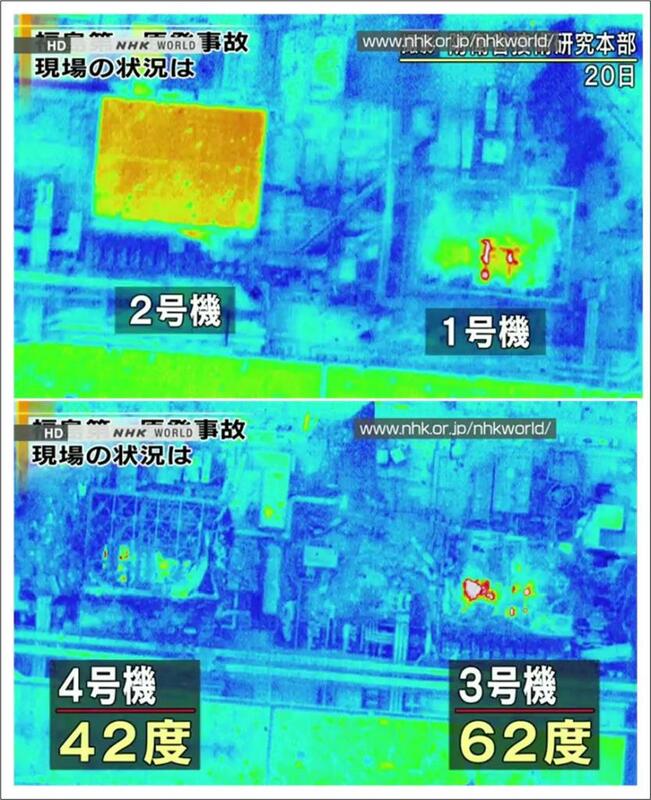 ・Ministry of Defense performed activity of measuring surface temperature ateach of unit 1,2,3 and 4 from the sky using Helicopter to evaluate the effect ofthe operation of filling the pool with water from the ground today and yesterday.Ministry of Defense expressed the opinion that surface temperature of each unitseems to be 100 degree Celsius or below. What remains to be known is how much distrust and incomplete information played a role in what has turned out to look like a decision that didn’t have to be made in time for a congressional hearing. Yes, that’s hindsight, but these questions deserve answers and soon. If the Dai-ichi crisis fails to teach us the importance of moving forward on the implementation of a more advanced and safer nuclear technology, it would be a tragedy. In the coming weeks, I will also be dissecting this new lesson of history on BraveNewClimate. But I want to wait a little longer yet — at least until all those units are in cold shutdown and the spent fuel pools are lukewarm once again! At 07:00PM (JST) on March 20, radiation level outside main office building (approximately 1,640 feet from Unit 2 reactor building) of Fukushima Daiichi Nuclear Power Station: 2,623 micro Sv/hour. Measurement results of ambient dose rate around Fukushima Nuclear Power Station announced at 4:00PM and 7:00PM on March 20 are shown in the attached two PDF files respectively. For comparison, a human receives 2,400 micro Sv per year from natural radiation in the form of sunlight, radon, and other sources. One chest CT scan generates 6,900 micro Sv per scan. At 3:00PM on March 20, pressure inside the reactor core: 0.187MPa. 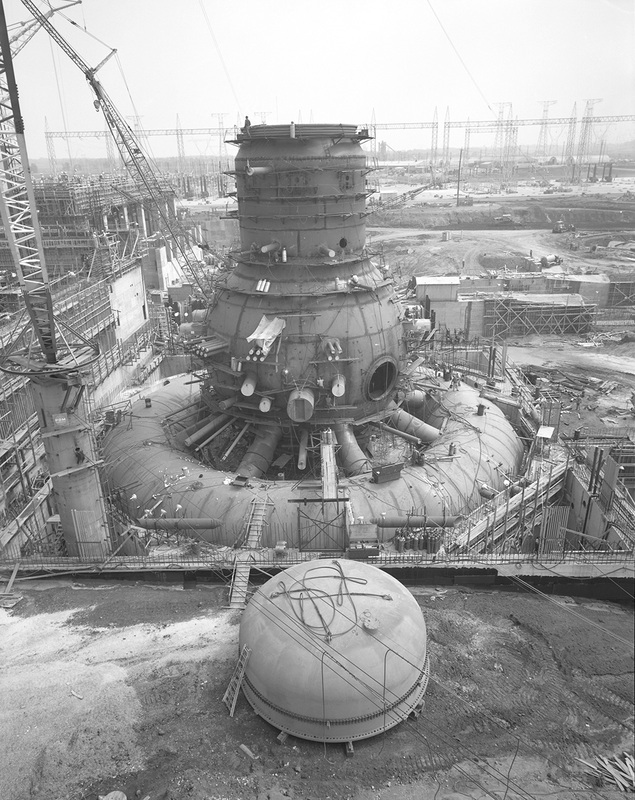 At 3:00PM on March 20, water level inside the reactor core: 1.7 meters below the top of the fuel rods. At 3:00PM on March 20, pressure inside the primary containment vessel: 0.17MPaabs. As of 6:00PM on March 20, the injection of seawater continues into the reactor core. As of 7:00PM on March 20, activities for recovering the external power supply are underway. At 3:00PM on March 20, pressure inside the reactor core: -0.016MPa. At 3:00PM on March 20, water level inside the reactor core: 1.4 meters below the top of the fuel rods. At 3:00PM on March 20, pressure inside the primary containment vessel: 0.125MPaabs. As of 3:46PM on March 20, the distribution board began to receive the external power. At 4:00PM on March 20, pressure inside the reactor core: 0.119MPa. At 4:00PM on March 20, water level inside the reactor core: 1.65 meters below the top of the fuel rods. At 4:00PM on March 20, pressure inside the primary containment vessel: 0.290MPaabs. As of 7:00PM on March 20, about 2,605 tons of water in total has been shot to the spent fuel storage pool. At 8:20AM on March 20, 10 Self Defense Force vehicles began to shoot water aimed at the spent fuel pool, until 9:29AM. As of 7:00PM on March 20, about 83 tons of water in total has been shot to the spent fuel storage pool. At 4:00PM on March 20, the temperature of the spent fuel pool was measured at 95.2 degrees Fahrenheit. At 10:14PM on March 19, ump for Residual Heat Removal (RHR) started up and cooling of spent fuel storage pool has started. At 4:00PM on March 20, the temperature of the spent fuel pool was measured at 82.4 degrees Fahrenheit. At 09:00AM on March 19, the temperature of the spent fuel pool was measured at 134.6 degrees Fahrenheit. So, is it now under control? 1) First, they will say that the accident ‘could have been much worse’. That consequences far worse that were experienced *could* have happened, if only things had gone differently, if we had been less lucky etc. 2) After the WHO and other health officials have come to a conclusion on the radiological fatalities as a result of the release (this may be zero), the anti-nukes will all come out and say there was some kind of ‘conspiracy’ or ‘cover-up’. They will say that the true scale off the accident was covered up, not to give their supposed nuclear pay masters a bad name. Just thought I’d put it out there now. 3) Despite the lack of immediate casualties the number of long term deaths from cancer won’t be known for decades and could number in the [insert large number category here]. Thank you for putting the Bloomberg article at the start of your update (and thanks for weblog, too!). I have been trying to find a direct quote from Steven Chu –not a reporter’s paraphrase– that supports the headline. Perhaps with the combined search powers of your contributors we can turn one up. p.s. Also, thanks for not booting me. I am not good at tact. Real information from you again. I feel I can now get back to everyday activities – while still checking on your blog for updates now and then. What effects will the lack of power from the Fuku plants have on the region and Japan as a whole? Huw Jones & John Morgan beat me to it. This is exactly what we are going to face, but I think this time we can deal with it. We are much more organized now that we where in the past and we can meet these sorts of statements better than we ever could. They won’t get a free ride this time. As a pro nuke advocate the introspection I would like to see most relates to design parameters such as maximum design earthquake and maximum design tsunami. 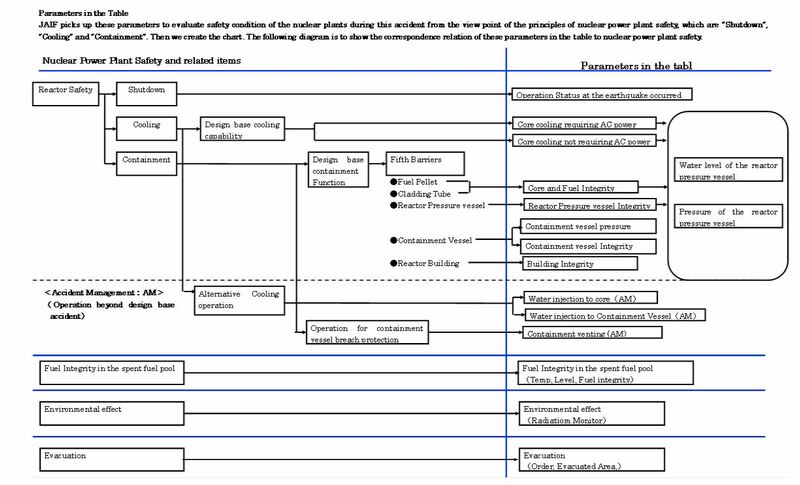 One way that I can see for netizens to help this along is to update wikipedia with these design parameters for all existing operational nuclear plants. It would also be useful for pro-nuke netizens to use this information to disown certain nuclear power plants. Not to suggest they should be closed but rather to suggest that there ongoing operation should deserve greater skepticism. Not just in terms of their threat to human life but also in terms of their threat to industry credibility. DV82XL, I remembered what you said the other day, about the first air crashes in the 50’s and 60’s, and peoples sensational reactions. At first, I wanted to agree with you, but didn’t. Today however, I actually saw some things to validate your argument. People I spoke to or over heard at university were saying things along the line of ‘the titanic sank, but we didn’t abandon sea travel’. I even spoke to a fund raiser for FoE, who when I mentioned I supported the use of nuclear power, said he personally disagreed with the stance of his organization on the matter! I think we need to and can spin this to our advantage. “If the Dai-ichi crisis fails to teach us the importance of moving forward on the implementation of a more advanced and safer nuclear technology, it would be a tragedy”. Indeed. If safer Gen 4 technology can’t be pushed forward now, it would be a tragedy. Unfortunately, anti-Environs are sounding more and more like BP apologists during the gulf drilling “spill”. but I am curious about how quickly dose rates decline with distance from the plant (I think I read “exponentially” somewhere?). Would dose rates 1, 5, or 10 km from the plant be “dangerous to human health”? That is, is the exclusion zone purely “precautionary” or would people who stayed within it (and were “unprotected”) be at risk of adverse health effects? Will former residents of the Fukushima exclusion zone ever be allowed to return to their homes? If not, what is the cost of this? Wouldn’t this fact alone make nuclear uncompetitive amongst competing energy-generation technologies? I am not sure if this was discussed before, but I am wondering about the meaning of the pressure readings of reactor 2. Does the lack of pressure within the reactor pressure vessel not imply that there is a leak or at least a hung vent? The huge amount of steam being produced by the underwater parts of the rods should cause some pressure as it does in reactor 1+3. I don’t want to exaggerate, but could it also mean that a little melted fuel burned through the vessel? What is the likely reason for the total lack of pressure? On the other hand, the low pressure of the containment indeed could mean that there is a small leak in the containment. The given 0,13MPa (just 0,3 bar above atmosphere) might be solely due to the sea water injection (water supply being slightly higher than the drain). The constant drain of steam out of the building also implies that there must be some leak caused by the explosion near the wetwell. Any further comments/insights on that? This past week’s side track on nuclear drama has been at the expense of real people with real problems. Perhaps now the journalists will return their attention to the real dead, damaged and needy in the Japanese community and help us to find ways to help. After the communities recover a semblance of normal life and after the emotional outbursts have subsided, the value of continually updated advice and hard data might just be recognised by a few more people. My hope is that public opinion will turn away from some who have cried wolf and towards those who can be trusted. Thanks, Barry, for a truly superhuman effort with this blog. Just reading through it daily is a task. Actually compiling it is a huge credit to you. 2.2M hits! It seems to be only yesterday that we counted down the first million. I don’t think we need to move all nuclear plants to design basis disaster “Godzilla”, but “design for failure” in the sub-systems and backups would be nice. I.e. start with the assumption that a disaster has exceeded deign basis and figure out what inexpensive changes can be made to minimize or localize damage, and allow damaged parts to be bypassed quickly. This is a philosophy I’ve developed while building combat robots (battlebots) and it resulted in some bloody tough machines. Maybe someone on this board can clear up some confusion I have regarding radiation. Japan recently stated that spinach and milk have been contaminated with radiation. Is the radiation from the nuclear reactor different than ever-present naturally-occurring background radiation? Does the ‘contaminated’ food now just have more radiation? The impression I get from reading various articles is that it is only the radiation from the reactor that can fool your body into storing it whereas natural background radiation is not stored by the body. True or false? Huw Jones – Yes I’m seeing it too. I can’t claim any deep insight into human behavior, but I have studied this phenomena as it occurred in several other domains, and I could not see how it would be much different with nuclear energy. After all, we learned to live with the Bomb, a bit of nuclear technology designed to kill us. @shelby – Care to elaborate, or is this just a drive-by shooting? Jeff Bullard, on 21 March 2011 at 11:53 AM — The entire portion of Japan using 50 Hz electrical power is in a serious power shortage with rolling blackouts. This means that industrial operations in the region have to have come to a halt, but I’ve only actually seen sporatic reports. The electric power situation will slowly begin to improve due to various efforts that Tepco is surely undertaking. However, I’ve seen a responsible indication that this will take ‘one month’. Looking at the photographs it looks to me more like water vapor (condensing moist air) than like smoke (particles from combustion/rapid oxidation). Water vapor disappears fairly close to the source; smoke gets carried along until the wind dissipates it; the two can be distinguished with a variety of instruments. Visually, only the earliest cloud from Unit 3 looked yellowish (more like smoke and dust); since then both have looked white in the photos I’ve seen. Hank, I think it’s very likely to be water vapour — cold air hitting those very warm pools is going to create a lot of mist. We must remember that it was snowing around there the other day. Marco, on 21 March 2011 at 12:14 PM — Yes, they mostly will be able to return as soon as the radiological survey is completed. The buildings within about 2 km of Fukushima Dai-ichi Generating Station that survived the tsunami may require some further delay and potentially some easily accomplished decontamination [called soap & water]. When the interviewer ask him if Unit 3 is the main problem, he corrects here and tells her it’s Unit 2. I am very confused by those remarks. David, I hope that turns out to be the case. As with 3 Mile Island, how close this came to a total disaster, the fact that this one was barely brought back from the brink, will mean far more to the public than the implied message that the public was spared any serious exposure to radiation. That is assuming that this is in fact winding down with no serious meltdown or release of radiation. OK, now at least we understand where you are coming from, which is an amalgum of facts, hearsay and guesswork. I hope that the quality of reporting improves, now that the immediate threats have been reduced. Even with asuch an improvement, before we can reliably make the kind of statement that you have (one way or the other), we may have to wait months while hidden facts are prized out, analysis done and arguments resolved. The next two or three months will be extrmely interesting. > body. True or false? My passion is communication. My angle is more or less examining reality, and how we communicate ideas and opinions. I don’t really have an axe to grind or a dog in this fight, other than the relentless pursuit of truth. The body stores radioactive isotopes rather than radiation. learning to live with the bomb is hardly relevant is it? People learn to live with hemorrhoids (and much worse), but nobody asks for them! Or are you actually saying that people accept that the benefits of nuclear weapons outweigh their risks? @bks, Not sure what inconsistency you are talking about. Secretary Chu was addressing whether there is a possibility of containment breach. And from radiation reading, it was possible, though we cannot know for sure, that unit 2 might be breached. The current worry about unit 3 is with regards to its spend fuel pool, which he did not address. Some time ago I read that ‘they’ are laying so many Klms of lines to bring power into the plant or ‘this will be the longed electrical lead’ etc. My query is that, as a power station it must have lines supplying the grid, why those existing lines could not be used to draw power from the grid. May be the grid lines suffered extensive damage due to earth quake! Well, worse must be long over if the comments are going to stray that far off topic. Why then do we have all these partial meltdowns and dysfunctoinal pumps? What does this say about the claiims from engineers that design can prevent problems. @jim – The point is that the fears of the past that had folks building bomb shelters in their back yards, and kids shaking in terror in their beds at night, each time an aircraft went overhead have passed and we have collectively learned to live with the risk. Poor form, though, trying to drag a red herring into the discussion – you knew damned well what I meant when I wrote it. EssGee, on 21 March 2011 at 1:58 PM — They had to lay 1.5 km of temporary power cable from the closest tap point on a working transmission line. The regular transmission lines ended in switchyards deestroyed by the tsunamis. It is possible that debris swept along by the tsunami downed some of those big transmission line towers; that happened from the storm surge of Hurrican Katrina in Mississippi. .The body stores radioactive isotopes rather than radiation. Could you expand on this a bit more. I assume that if, and only if, a body stores radioactive isotopes, then it stores radiation. Also, if and only if, a body is storiing radiation, then it is storing radio active isotopes. @DV82XL No I didn’t. And I still don’t see the relevance. First, thanks to Barry for generating each day a thoughtfully reviewed digest of news from Fukushima, and thanks to commenters for the civil and informative discussion. It has been most useful in putting a scale to what worst outcomes might plausibly unfold. 1. 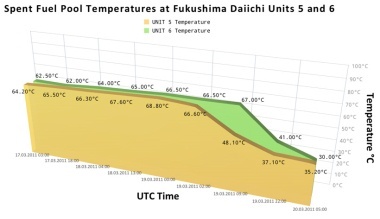 In the plots of “Spent Fuel Temps […] Daiichi Units 5 and 6” — anybody have a theory as to why the temps sat rather stably at around 66C in both units for three or more days? That’s a higher-than-usual temp, right, but why exactly that temp? Maybe it’s totally explicable, but as a data analyst, data that’s that stable in the middle of disorder jumps out as at risk of being an artifact of some kind. 2. Regarding laments that people will say it could have been much worse: When engineers and technicians volunteer to put their lives or health on the line to try to fix it, their assessment is conspicuously that it could have been much worse, and that’s a pretty persuasive assessment. Does that by itself mean abandoning nuclear power? No. But it does mean that belittling the “could have been much worse” opinion might not be the best way to deal with it. I think one needs an argument which accepts that it *could* have been much worse, and actually addresses it — like how much worse could it have been, and why that’s acceptable. First, radiation is not stored, it’s emitted. So I think what you mean to say is radionuclides, or radioactive isotopes. In this case, the answer is false. Let’s take potassium for example. You need potassium to live. Your body takes up the radioactive isotope of potassium (potassium-40) just like it takes up the stable form of potassium (potassium-39). It doesn’t matter if the potassium-40 was created naturally in a supernova explosion 5 billion years ago, or artificially 3 weeks ago in a laboratory. It’s taken up by your body and eliminated just like any other form of potassium. @jim – People learn to like with risk, and their perception of risk is inversely proportional to the novelty of the risk, not the facts, and not the probability. Like in everything: familiarity breeds contempt. The funny thing is that during the Fifties and early Sixties when the fear of nuclear war was at an apex, no nuclear armed state had arsenals large enough, or reliable enough to successfully prosecute a nuclear war. However, in the Seventies, when military strategists were openly discussing preemptive strikes as legitimate elements of nuclear doctrine, and the number of deployed warheads, and their reliability was at a peek, nobody was panicking, and the conversation became rational. I suspect that we have reached that juncture with nuclear energy with this event. @shelby – the moderators here are quite good, actually – I’m surprised at the kind of stuff Prof Brook allows to be posted on his blog. The problem is one of facts vs. supposition and assumption. If you are passionate about communication, then you must be aware that effective communication must be founded on facts. Ineffective communication often contains true-but-misleading information, such as your comment about the two technicians that died at Fukushima Dai-ichi, which implied that they were killed by radiation (even if you didn’t state it outright) – the only reports I’ve seen about that stated that they went missing during the tsunami (and, honestly, a 10m tsunami and only 2 people missing out of the entire workforce? that’s remarkable!). If you have a factual report that states otherwise, then provide a link to it, and your post wont be edited by the moderators. Your point about seeking the truth is very appropriate, though – much of the mainstream media reporting on this crisis has had scant regard for the truth – even now a quick search of news articles reveals some that are talking about having the bury the reactors under sand and concrete, and making direct comparisons with Chernobyl, when the latest, most factual information (as reported by Barry here) suggests things are very much getting under control. And to your statement to the effect of “it would have been worse, but we got lucky”, I’d say this: no, we got extremely *unlucky*, for a nuclear plant to be hit by a 9.0 earthquake followed by a wall of water the height of a four-storey building. What saved the day, as it were, was good engineering that resulted in a reactor design that survived all that. Are there safety improvements that could, nay should, be implemented, after seeing what happened at Fukushima? You betcha! After all, if a 40-year-old reactor design *nearly* comes through unscathed after such an event, then things are looking good for newer plants, which generally have much more robust designs (including getting rid of the requirement for external electric power during the cooldown period). Don’t forget that it’s winter there, with outdoor temperatures around (or below) freezing. It could be that 66ºC was about the equilibrium point, between heat generation by the spent fuel in those pools, and heat loss to the environment. Thought people would like to know what one of these Mark I reactors looks like as they are being built. Vimsical, where does Chu say the worst may be over? He replied: “No, you are not … You and your hard-core anti-nuclear cohort are a small and increasingly marginalised minority whose chief value lies in remaining what you are so as to provide an easy target for criticism and ridicule in service to the pro-nuclear cause.” With that, and some childish remarks from others, I lost interest in pursuing this issue. Finrod: are you still arguing for fewer safety precautions in order to make nuclear energy more competitive cost-wise? Seems to me that after Fukushima that will be an even harder call than it was before. While I’m here, let me mention that I’ve read “Prescription for the Planet” by Tom Blees. He seems to me to make a good case for the use of Integral Fast Reactors. Amongst other advantages, these solve what many people see as a problem: the treatment and storage of spent fuel rods. Are IFRs still on the drawing board? to get an idea of the scale of it notice the guy working near the top. @DV82XL: OK thanks, I see where you are coming from re living with risk, but there is still a fundamental difference I think b/w risks we choose to live with because of other benefits (e.g. nuclear energy…) and risks we have to live with because they just exist (nuclear weapons….once created). BTW I thought that the threat of nuclear attack (if not “war”) was actually pretty real in the 50 & 60s – esp Cuban missile crisis? Anyway, apologies for the “red herring”, I was genuinely confused by your comment, but on reflection it was not important. How many people are there in the 20-30 km zone? is a troll who has contributed nothing to the factual discussion at hand, other than trying to introuduce FUD as much as possible. I have tried to point this out to shelby, but this person has tried to post here as if it were a typical web dicsussion board. Please shelby, read the parameters for posting on this board. Are you ready yet for some sharp criticism of failure to grasp that when the authorities that actually know the situation decide that a 20km evacuation of about 200,000 people is necessary under the worst possible circumstances following a major natural disaster then there IS a “serious” problem and there IS a “credible risk” of it getting much worse? Terje’s proposal to update wikipedia with earthquake and tsunami design limits of existing reactors and “disown” some is the only constructive response I’ve seen so far. Its remarkably close to recognizing that the nuclear industry at least in Japan is seriously under regulated and needs greater public scrutiny, especially from people supportive of nuclear power. Here in the USA, CBS featured the Fukishima situation on their “60 Minutes” program this evening, somewhat delayed owing to the more pressing issue of college basketball (March madness). I was expecting “Chicken Little” alarmism but the program was well balanced and sensible except for the US state department official in Japan [ad hom deleted] She was advocating expanding the 10 km evacuation radius to 50 km without any logical explanation. Barry’s OneplusOne video makes it onto this popular CC blog. Should get a lot of hits there. So now Rod argues, admitting his view is a minority in his profession, that the whole concern at Fukushima was a load of hokum, due to there was no possibility of a zirconium cladding fire. This isn’t the type of argument that is going to pay off for nuclear advocacy. I would have thought that a scientist, such as Barry, a distinguished scientist like Barry especially, could understand something about the way understanding is established in a scientific discipline. If Rod is correct about what he thinks about the scientific case on ozone depletion, it also applies to climate change, because many of the same scientists are involved, and the same gases are involved. If science cannot be said to understand what the properties of a major driver of climate change is, i.e. ozone depleting gases are an important driver of climate change, they really can’t be said to understand climate change. The whole thing is liable to be bogus if it is this far off base. I warned Barry that Rod was taking this position some time ago, and that views such as Rod’s were prevalent in the nuclear industry in the US, especially over climate. By featuring Rod here telling us most of his industry and nuclear scientists don’t have a clue about what they are talking about, it is the same thing as having someone like Lord Monckton up there, let’s all pretend he isn’t going around telling everyone climate scientists don’t know anything, he’s saying something we want to believe about nuclear power that is so far off base even nuclear power people don’t generally believe it, why he says everyone in authority at Fukushima didn’t have a clue what to be concerned about, there was no problem if a spent fuel pool went dry. It doesn’t matter if the authorities or Rod is correct about this one at this point. Obviously, nuclear power is not understood enough to be fooling around with. If the industry doesn’t understand what it is fooling with enough to be able to tell us whether there is a problem or not while the crisis is on, THIS IS ROD’s POSITION, what are they doing scaring people with their preposterous blundering around declaring evacuation zones etc. On the other hand, if Rod is mistaken, what is he doing up there being quoted by Barry? If Barry is right to quote Rod, then the whole “crisis” was a load of bull and Barry is wrong to have ever gone back on his position that there wasn’t much of a problem to when he said there was a threat. What is going on here. This is turning into a madhouse. Ms. Perps, check out monitoring stations 32 and 33 in Fukushima province. That removal of my post was quite something to see you do. Your post has been moved to Pending. Prof Brook is not on the blog right now and I would prefer he checked/edited it. Nothing I read in your comment addresses that. Do you know of any experiments that do so? In my opinion your position seems to be based on fear though maybe I didn’t read it as thoroughly as I should have (it’s a little long, short on time). Can you please provide something more concrete. Please indicate who said the Japanese are trying to hide information? The information is good for 20 March 2011, but the earthquake occurred on 11 March. The link you provided, for Fukushima, is excellent for this 20 March date. Are you able to indicate the early reports. The data for Iwaki (ie from Mito) seems a long way south. Is there a more northern Iwaki monitoring point? surely? I am surprised that the weather column only addresses rain, why not wind direction and speed? 2jim – We will have to leave it at that, as were are drifting off topic, but you might want to take a closer look at new information that has come to light in the last decade about the Cold War, if you are interested to learn the differences between reality, and what was being assumed, by all of the players at that time. “radiation” as used in the nuclear sense is beta, alpha or gamma radiation… “stuff” that gets emitted when radioactive atoms break down. This radiation in various forms can hurt you because that radiation can mess with your body. Radiation isn’t “stored” by the body. As a first order approximation think of it as a very bright light or heat: the light can burn you, but it doesn’t get stored in you in any manner. Nor can radiation travel in the wind, water or food. What CAN travel are the radioactive isotopes that, when they decay, produce radiation. Your body can’t tell the difference between normal Iodine and radioactive Iodine. They’re the same for all purposes except that the atoms of radioactive Iodine undergo “radioactive decay”, that is, they self destruct and in doing so they emit the above described radiation which, in turn MAY cause damage to other nearby molecules.. like DNA. Why is this relevant ? Well, the workers at the nuclear plant, which is coming from e.g. the possibly uncovered fuel rods and from radioactive chemicals that have escaped in the steam releases, possible fires etc and have been deposited around the site because its intensity drops off very quickly. That’s why at times of high radiation the workers had to “clear out” for a while. People away from the site don’t generally have to worry about any of that radiation that’s being emitted at the site itself. Instead, they have to worry about radioactive atoms (iodine, cesium and possibly many others) that get into the air or water etc. If you get the radioactive stuff ON you, you can just wash it off and generally you’ll be fine (that’s what “decontamination” often means: wash the radioactive stuff off). If the radioactive stuff gets IN you, then it’s potentially more of a problem because it’s harder to wash people on the inside than on the outside. Please feel free to conduct experiments to prove me wrong is Rod’s idea of a joke. No one has ever filled a spent fuel pool up with spent fuel rods from several nuclear reactors then drained the water out to see what would happen. The only people who ever would do that have billions of dollars at their disposal. Computer simulation done in US national labs means nothing to Rod. A computer simulation done by a US national lab is the best assessment we’ve got and they say what can happen if a pool doesn’t have water in it and even if it is only partially full, is a propagating zirconium fire. Correct. The optimal strategy for anti-nukes at the moment is to present themselves (in the guise of the environmental movement) as the key demographic to bring on board for the pro-nuclear cause. If they can convince us of this, they can control the pace of progress towards (or away from) the goal. They have occasionally had some success with this strategy. They must not be permitted to enjoy any more of that. You have me mixed up with Peter Lang. My position is that the modern Gen III+ designs are sufficiently safe and are so far through the design and regulatory approval process that it would actually cost more to impliment the ‘savings’ Peter believed could be achieved. My previous post was a response to marnit. The body stores glucose & fat rather than energy. It might be regarded as semantics to some, but the distinction needs to be understood. I did see a recent clip from a US news show (some local San Francisco TV station) that was interviewing some grad students from UC Berkeley where they applied an acetylene blow torch to a zirconium fuel rod (sans nuclear material, one presumes). This did seem to show that the cladding itself would not catch fire under these circumstances. Is there a reason why this cannot be extrapolated to the fuel pond case? Now that BNC is returning to more normal loads the moderators intend to return to more normal lives. As a result, please be warned that, any comment violating any of the Commenting Rules will be immediately removed to Pending for review and will not be edited. Most notably please keep to the relevance of the post and do not wander off into personal opinions philosophies. Open Threads where this can be done are instituted from time to time by the host of the blog. These update threads are going down the toilet in terms of utility. Early on in the crisis, they were a great source of info and knowledge ( posts from em1ss, Luke Hanson, and Seamus and a few others), but now they are deteriorating into political debate and sniping by people who clearly don’t know as much as they think they do. I wish the mods would limit the update threads to informational and on point posts only, the other stuff I can get at about a million different sites. I have removed many comments violating commenting rules, particularly about the RELEVANCE of the thread. Prof Brook will decide what to do with them. This whole discussion of Gen III+ design features is off topic to this post. Please take it over to the most recent ‘Open Thread’. This is my one and only ‘suggestion’ on this matter. All workers have now been pulled out due to steam rising from reactor 3. The BBC is reporting that no increase in radiation has been detected. Grayish smoke was seen billowing from a building that houses the No. 3 reactor of the troubled Fukushima Daiichi nuclear power station on Monday, plant operator Tokyo Electric Power Co. said. After the smoke was spotted at the southeast of the building around 3:55 p.m., TEPCO said it had temporarily evacuated its workers from the site as it assessed the situation. Barry sorry about the off topic replies. Won’t continue that since people are on this thread to get updates about the situation in Japan. 1) Why was Daini OK? Looks like all its reactors are in cold shutdown and yet it got an even bigger tsunami; why didn’t its backup systems get trashed too? 2) How long until they will be able to move the nuclear material away from Daiichi to a safer location, once it is stabilized? If I were the Japanese, I would be worried about another earthquake/tsunami coming along and trashing Daiichi again. I am unwilling to provide a point by point rebuke, because it can be easily falsified by a wikipedia-search. PS: Barry, it’s getting harder and harder to read here. This site was a great news source but lately the signal to noise ration has massively worsened. Could you please filter out all this crap? I think in these status threads absolutely ONLY status of the plants should be discussed and anything Japan, nuclear general be put somewhere else. i want info – not discussion. It looks like I can’t take a break without chaos setting in! Barry and I are working on the problems now. I have sent severasl off topic posts to Barry for action. I REPEAT – STAY RELEVANT OR GET CHOPPED. POST ON AN APPROPRIATE THREAD PLEASE. JacksonP, I agree completely. I’ll set up a FD open thread and corral all off topic ‘debate’ there henceforth. Will put that up within the hour. If the people within the 30km zone who have been told to stay indoors have now been told not to drink tap water, how are they to get access to water? Can they pop out to the shops quickly? Would bottled water from the shops be safe? Are the shops even operating at this time or are there people delivering them supplies? Also, how long is it likely that they will be advised not to drink the water ? BBC: Smoke emitted by No3 for about 2 hours. Staff withdrawn as precautionary measure. No increase in radiation detected. Another plume of smoke from No2 later. Radiation not yet assessed. They have been (from the very start) instructed to follow standard radiation safety guidelines when venturing outside can’t be avoided. This is, wearing a mask or a scarf to protect their airways, not eating or drinking anything that has been exposed to the air outside, brushing their clothes before entering a building, and washing their hands and face every time they have been outside. There is talk now of filling the Unit 4 SNF pool with concrete… http://www.cnn.com/2011/WORLD/asiapcf/03/21/japan.nuclear.reactors/index.html I do wonder if this is a measure that is being seriously considered though — one to monitor. Would that help the situation? In a water pool the heat is removed effectively by convection but if encased in concrete which is a pretty good insulator you’d generate much higher local temperatures. Isn’t that why these rods go to the water pool in the first instance before going to dry cask storage? The earthquake may have demolished the transformer yard, which I guess would commonly supply power to the grid at 300kV or above. The station auxilaries would be fed from much lower voltage supplies, typically 11kV in power stations I have worked in. My guess is that the new power lines – the long extension lead, if you wish, is at a much lower voltage than the HV grid. I also guess that damage to transformers and switchgear would make recommissioning of the HV switchyards a very difficult proposition, or at least much more difficult than, say, working with 11kV and a few much smaller step down transformers, right down to 110VAC, or whatever the lowest voltage supplies to battery chargers, etc, require. In summary – What is needed is auxiliary supply at and below about 11kV, not main HV transmission voltages of 300kV or thereabouts. Chalk and cheese. Does anyone know if this claim is true? If so why haven’t the media highlighted this? Shows problems with all kinds of power sources when subjected to catastrophic natural disasters. Sir, would you please be so kind as to tell me what you did with the comment? I’m not deleted, not not deleted, not rerouted, i feel like i’m hangin in mid air. Not withstanding the value of any other opinion, its dead serious to me and i put in quite some effort to put it together. I can provide argument for my statements. I’d have thought that water can act in two ways to reduce heat buildup in spent fuel storage tanks. 1. Convection, including to a point where pumps can circulate the water through coolers. 2. Interception of the nutron flux emanating from individual fuel rods, thus reducing subcritical reactions and thus speeding the overall reduction of radioactive processes within the rod bundles. Concrete can act only in the second way, but has a bulk density of about 2.3 times that of water. There is much more mass between the rods. Perhaps someone better informed than I am can set me straight if I have erred in the above – I’m no expert. I suspect the CNN concrete idea is a misunderstanding of the (accepted) offer from a construction company to use their concrete pump trucks with 50m reach to pump water into the fuel ponds with better accuracy than the fire engines. Funny how the mainstream news only focuses on the negative. Let’s not forget about all that went right. Automatic shut down of the active units, EDG’s ran until the Tsunami hit, the battery backup systems worked for its designed life expectancy, remote monitoring, containment integrity and Etc. Towns were literally swept away leaving the utility worked the problem with almost zero resources. I think a lot can be learned from this event. Not just con but pro as well. I have a copy and its a response on response on earlier comments i made. What do you suggest i do? I dread not post it in the first place, but i do ow explanation. Ms Perps, we are heading off topic with this talk about hydro, but I will try for relevance. Russia, 2009 – 75 die due to hydro dam failure. China, as noted by you, 20,000 plus due to hydro dam failure. Japan, as noted by SMH this weekend, somewhere between zero and a handful – perhaps more – but all deaths were to workers on site and not to local residents. At this stage, not even one confirmed death at Fukushima due to radiation. I will be watching Barry’s posts, and others’, closely, for final analysis of fatalities, if any, due to radiation at Fukushima. Bravo SMH! While there may be a few subcritical fissions happening to the fuel in the pool, the heat from these reactions is many orders of magnitude lower than the decay heat from the fission products. Many thanks, nkinnear. We can forget about either water or concrete to slow down the remaining few reactions. Concrete must be all about shielding and locking in radioactive dusts, etc. Or am I still muddle headed? Water, it seems to me, is much to be preferred, provided that the bath has not been cracked. Whether it ultimately is proven that a propagating zirconium cladding fire was the threat the 2006 US national laboratory simulations indicated it was, or this possibility is eventually proven to be not credible, the fact is that after Fukushima, more data than applying a torch to some zirconium will be demanded by many. I think it will have to be supplied if the nuclear industry wants some kind of future. One reason the US felt it was possible to sign the comprehensive nuclear test ban treaty, and although it did not ratify, what allows it to continue to live up to its terms, is because computer simulation based on the known properties of materials makes it possible to certify the safety and effectiveness of its current stock of nuclear weapons. The last US bomb test was in 1992. That 2006 report on spent fuel pool risk of zirconium cladding fire also cited ongoing studies that were not completed by the time the report had to be finalized, as well as the studies that were available. It is a bit hard for me to understand how it could possibly be that the best assessment of the latest work was not conveyed to the senior authorities during the worst of the Fukushima uncertainty. Everything will come out in the investigation that will be forthcoming. What this industry needs is a better idea of what can happen in these unlikely scenarios. If they can simulate atomic bombs with computers they can simulate reactor meltdowns and loss of pool coolant events, if not in 2006, and even if not now, its got to be soon, re read the exerpt from Chu. And if people are really going to insist that simulation is not the real world of water, zirconium, and ceramic, therefore we should listen to them when they tell us nothing can happen, there are going to have to be underground testing of fuel pools and reactor meltdowns at sufficient scale to be convincing or this industry will not have much of a future. Just predicting. Grey smoke? Grey is not good. White may be just water vapour, but grey implies something more dire. @bks: Bill Borchardt, Operation Executive Director of the US NRC is currently updating the US Senate. He stated that they believe the situation at units 1, 2 and 3 has been stabilized. He also said that they do not know the source of the grey smoke from Unit 3; however, there has been no increase in temperature or radiation readings. I’m no expert, but I take that to mean the smoke may be from something mechanical rather than nuclear? First time to post. Fantastic job of providing very level-headed commentary and common sense. First off, I’m in Huntsville, Alabama, USA. Live 20 miles downwind from Browns Ferry Nuclear Plant. So, I have more than a passing concern about nuclear safety. What does common sense say? Japan suffered two, TWO, once-in-a-hundred-year natural disasters within 45 minutes of each other. Both of these disasters exceeded the worst case scenario designs of the nuclear power plants in question. Although the damage to the area is devastating, the nuclear plants survived with enough system integrity to allow the workers to shut down the reactors and engage (with extreme difficulty, admittedly) the emergency systems to insure that a deadly/very harmful release of radiation to the general public did not occur. We should first praise the designers of these facilities for their excellent job. But, there are still major problems to be addressed. As you have well documented, the backup emergency systems were not “hardened” in order to survive the disaster. This is a fantastic opportunity for “lessons learned”. THAT should be the focus of the investigation of the disaster, and how to apply those lessons in the future. We have been driving automobiles for a hundred years now. Who would like to see all of the vehicles still providing the safety systems available in 1971? No front air-bags, no side air bags, no designed-in crumple zones, no anti-lock brakes, no widespread availability of shoulder harnesses, no radial tires, no traction control, no padded dashboards, no collapsible steering columns, no halogen headlights, very primitive tempered glass, no collapsible bumpers… the list goes on and on. But we still manufacture automobiles in ever increasing numbers. And drive them in ever increasing numbers. Let us take this opportunity to re-examine the designs of our nuclear power plants. And instead of trying to kill or limit their use, use this opportunity to make them safer, learn the lesson of Sendai and expand the use of nuclear power. knw, did he say the worst was over? In discussing design changes one topic I hear discussed a bit, but not that much is the location of the storage ponds outside the secondary containment. This apparently is not the case in later designs, and would seem to be a flaw in the light of the current situation. Don’t know how difficult it would be to provide some protection for the storage ponds, but I imagine this may become a requirement. Which answers the question as to “how long it’s taking” to get power restored. That implies quite a bit of needed reconstruction, as was also speculated here in the commentary. Didn’t this simulation that you speak of, “Spent Fuel Heatup Following Loss of Water During Storage,” conducted at SNL and previously posted by others, show the only credible scenario to be blockage of convective cooling via low water level? Meaning that hot fuel in the assembly could cool its self without bursting into flames given air could flow over the assembly unimpeded. Here is the link again if someone wants to read the whole report. @bks: I did not hear him state the worst was over, but I did not hear his entire testimony. From what I did see, he did not seem overly concerned. Good to hear, thanks Bjorn and Francois – it just didn’t make sense to me from the get go. Has anyone seen this photo of reactor 3? I don’t know how the cooling pond is still intact? It looks like the top half of the pool must be heavily damaged and the reminder full of debris. The idea of using a conctrete pump originates from this post. DrD if i recall correctly. The one who passed it on to Tepco, … some nutcase. Who would ever do that? The best invention i ever made was the part time idiot in my own head. The greatest discovery i ever made was to find out everybody has one. The difference is, i know. Its been paying off ever since. If that concrete pump’s deployment makes one bit difference, i’ve done more for this situation than most of you. By being nuts! 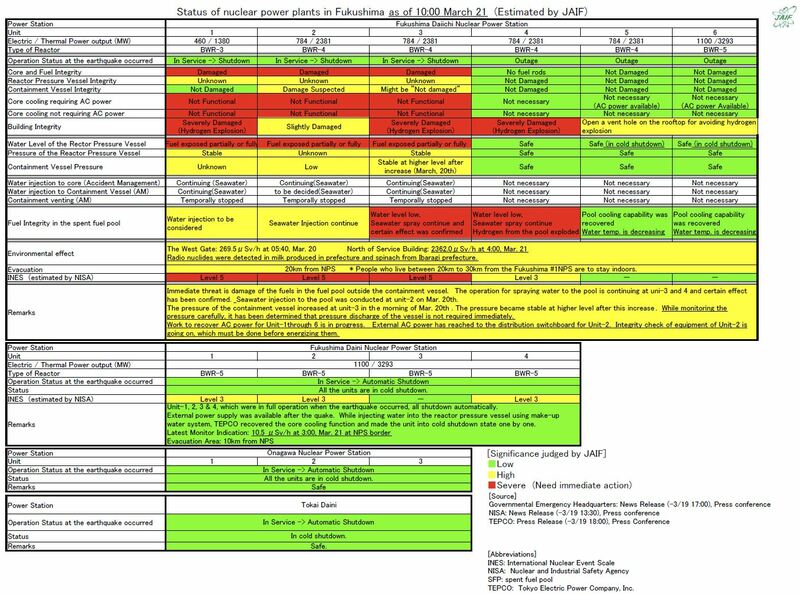 Latest JAIF reactor status report has been out for a while. 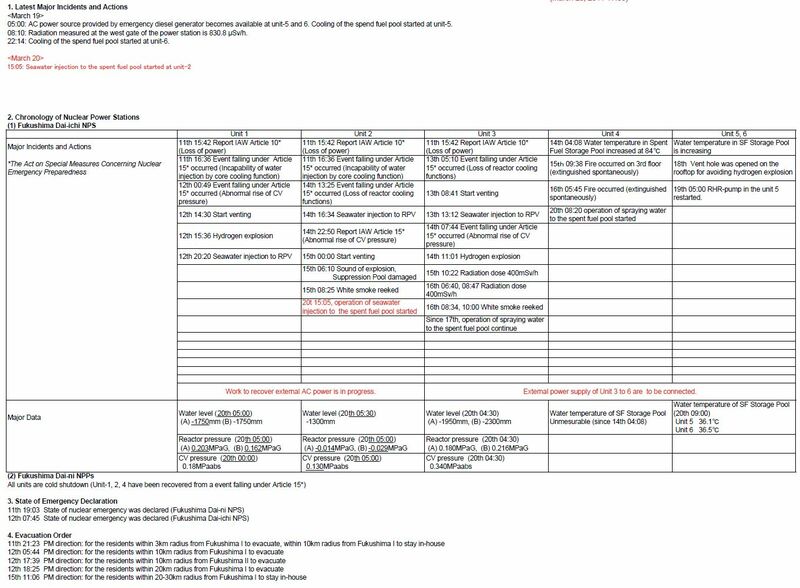 The only significant difference I can see between the last 2 reports is that they have changed the Pressure of the Reactor Pressure Vessel item from stable to unknown for unit 3. Maybe instrunentation problem? Radiation levels basically the same at West gate and North of service building. Ok west gate is old reading, so no information on change there. I do find the map of Japan interesting at the bottom of the report. The coloured area off the west coast seems to indicate the area affected by the tsunami. There are 14 reactors in this area. Three were operating at Fukushima Dai-ichi and 4 at Fukushima Dai-ni. Three of the reactors at Dai-ni have been given an INES rating of level 3. Still don’t understand that rating when that is the same rating they are giving Fukushima Dai-ichi unit 4 where the building was blown apart and there is a serious problem with the SFP. Anyway, the same report lists all units operating at Onagawa Nuclear Power Station at the time of the quake and the 1 unit at Tokai Dai-ni (unit 2, so the othe probably decommission, but I don’t know this for sure). The tusnami hit all these NPS, but only Fukushima Dai-ichi had real problems. Onagawa NPS is particularly interesting as it is much closer to the quake/tsunami source. Why did it have no problems. Design, tsunami height, luck? It will be interesting to see what a full analysis will bring out. It has been dicussed on this site that the trucks could not get close enough. What was not clear is that this is not a radiation problem. Radiation comes in two varieties: on its own or travelling on a particle. As far as the particles are concerned it really doesnt matter where you stand. They travel up, down, around corners, you name it. Radiation on its own doesnt. It travels in a sraight line, like light. You can hide for it. The trucks had to keep distance on account of ballistics. If you pump that much water at that much pressure at close range, you create a fountain that wavers of before it hits anything. The idea of the concrete pump was absolutely brilliant. Knowing that both fire fighters and nuclear specialists are human and humans are generally specialists, i realised they might not be able to think that far out of the box. So i contacted Tepco. So what if they think i’m a fool? If there is a remote chance they dont, this will help. Real on the spot help. I used to work for a volunteer fire chief. Nasty pyromaniac little bugger, but his knew his stuff and he loved talking about it. I also did my odd bit of concrete pouring. I know what those pumps can or can not do. I though finding that kind of stuff was what you were all talking about. That and putting ppl at ease. Last one has same label as previous, a mistake. While it is true that gamma radiation travels in a straight line, a gamma ray can interact with an atom and reflect off of it, changing its travel path at a reduced energy. Thus, gammas can scatter and travel around corners, or over shield walls. Much as I’d like to take credit for a Wizard Plan. I think the concrete pump idea was brought up near simultaneously in several places. However, this blog seems to have more cred than most any other so maybe gets attention from TEPCO. Anyway, props for having enough nerve to send it in to those who are really fighting the fight. This comment belongs on the Fukushima Open Thread. Please re-post there. Try think of Gamma as light. Imagine you are hiding behind a shield that holds Gamma, and then look at how much comes around the corner compared to how much doesnt. Do you see what it depends on? It is my lucky guess it works that way.Gamma coming around corners or not, i’d duck. I wonder if the grey smoke is something caused electrically since they are trying to reconnect power. I am very familiar with the way gammas scatter, as I have performed many calculations to determine their effect compared to the direct radiation level contribution. If you have no shielding, their contribution is very small. However, if the direct route is very shielded, then the contribution of the scattered radiation can be the main source of radiation at some locations. When you are trying to develop the shielding for a very intense source, effectively shielding the scattered radiation can be a challenge. Correct me if i’m wrong, but doesnt it still get significantly higher in front of the shield than behind it? Or is there actually some kind of Gamma Turbulence effect, like over a stalling wing. I’ve got a hard time visualising a Gamma radiation as almost particle. William Fairholm, quite right to ask questions about JAIF report on Unit 3. If someone in my group turned in reports like that I would give them one warning and on the second offense they’d be on the street looking for a new job. This is a link to a presentation about skyshine, which is what radiation that is scattered off of the atmosphere is called. It might help you understand it a little better. Don’t know if it has been reported here, but the smoke from the reactors has stopped. and they have released a survey of the plant for various radioactive materials and only iodine 131 was above limits for workers without protective masks. Doesn’t say where these measurements were made and whether these were maximum or average readings. I assume they were made were the workers are most in danger from these radioactive materials. The smoke from reactor 3 appears to be coming from the SFP. Smoke has also been seen coming from a crack in the roof of unit 2. The secondary containment of that reactor was not completely destroyed and so this is not directly from the reactor primary containment as that would be very radioactive and there has not been an associated spike in radioactivity that I have seen reported. In other words, source of the smoke unknown. Thanks for the home work. This is whole lot harder to visualise for me. If i understand it correctly, behind the wall is far from safe, but ducking would still be a smart move right? Or am i missing it? Gamma does not reflect on particles the way light does on dust or smoke. The physics of the scattering is different for gamma rays and light, but they are both photons. Those designated gamma rays just have a lot more energy than light photons, and thinking of them scattering as light off of smoke or dust is probably not a bad analogy. Certainly, if there is shielding between you and a radiation source, you are better off behind it than not. Its just that it may not protect you from all the radiation. ??? Its the obstacle that causes the reflective pattern that leads to local consentrations behind the obstacle, higher than there would be if there wasn’t any obstacle??? No; if you look at the example in the link above, you see that there is a wall between the source and the point of interest. The “skyshine” (scattered) radiation is interacting with the atoms in the atmosphere and scattering over the wall. For instance, a gamma ray could travel up above the wall, then reflect off an atom in the atmosphere, and back down to earth. Kinda like a bank shot in pool, where you want to hit one ball that is behind several others that you don’t want to hit. I am reading wrong, sorry. For a moment i thought it would be something like oscillation or whip effect. But there is an effect. The presence of the obstacle matters. Great ) Its not the easiest thing to understand. When you get down to that level, there are times when particles act like waves, and waves act like particles. Thats the beauty of it, isn’t it? Everything changes at that level You’d still expect to see a something, but what you find is almost like a… like a doing. The only way i can grasp it is as space being busy. Please put your comments in the correct thread. We have let some on radioactivity stay on the Fukushima update thread as they may be of interest to those reading that thread. However you are straying into mere comment and should post these on the Fukushima Open Thread. Further out of place posts will be deleted and you will be asked to re-submit on the correct thread. Duty calls, ayl beh baahck. Oh dear, did i do it again? I have found a possible explaination about how the SFP loss some of their water. The seals at the gate between the SFP and the reactor are filled with air which is maintain under pressure by electrical pumps. These pumps would have stopped when the station loss powere. All the SFP would have been effected and then the rest could have been lost by evaporation. There may have been other leaks specific to each SFP, but this is a problem all of them would have faced. William, thanks, this makes sense, assuming the setup is the same as used at Fukushima, and it’s the same vintage plant. It explains how the fuel is always kept underwater while moving it between pool and reactor. The same site has a possible explaination how an uncontolled hydrogen release could have occured from the primary containment to the reactor building. A test was done on a prototype containment design where they tried to increase pressure to 71 psi, but could not get beyond 70 since the containment started to leak. They tightened the bolts to reduce the leak, but pressure test on reactors were never done above the design limit of 62 psi. Wheter this is the way hydrogen got into reactor building will have to be carefully analysed. A lot of nth hand (and frequently mis-translated) information seems to be arriving here very distorted and taking a long time to be decoded. The example of the concrete pumping machine springs to mind. Since I have been reading this blog daily I had already seen linked pictures of such a machine and read the discussion about its advantages in the delivery of water to elevated SFPs. It was obvious to me that the CNN report posted by Professor Brook had somehow got hold of the wrong end of the stick and that the purpose of the machine was pinpoint delivery of water at height. There were 4 hours of confusion before bchtd1parrot sorted it. General ad hom: certain people here seem like strong noise generators. All other reports I’ve seen have said they have been spraying seawater into units 3 and 4 SFPs and they have injected seawater into unit 2 SFP. A discrepancy and would make recovery of SFP 4 to normal operation easier, I guess, but there is a lot of damage in these buildings. For those who want extensive time series radioactivity data for Japan can go to this site. Several formats. Unit 3 (in the middle) looks much worse from this ground level view than in the satellite/aircraft pictures. [comment deleted as off-topic. Please re-submit on the correct thread – Fukushima Open Thread. Thank you. I noticed a mention of the 60 Minutes interview with Julia Nesheiwat. She is a former military intelligence officer currently employed by the State Department. It is possible that she or someone like her with appropriate clearances is the liaison between our High Res. IR Satellites and other classified data and TEPCO or Japanese Government. IIRC, isn’t the crane for the rods only about half way up the “box” portion of the building? That would imply that a majority of the reactor vessel is underground? And therefore the Hank Roberts/David photo looks worse that it reall is, in that the pool is below the “halfway” point of the structure height, yes? 1. How is hydrogen gas generated by spent fuel rods in SFP’s that have some or all of their water lost? 2. If a SPF pond looses all its water, can the spent fuel rods catch fire and release some of the radioactive elements inside them? There is a video of a hollow zirconium rod being heated red hot by a blow torch, but it does not appear to catch fire. I am a chemical engineer but without any nuclear reactor experience. I have read a fair amount of information and technical reports on spent fuel rods that I will try to summarize here. I welcome any corrections or improvements. First a description of fuel rods and assemblies in old GE BWR/3 plants: A fuel rod is 0.563” OD by 144” long. The rods consist of stacks of cylindrical ceramic pellets of UO2 0.5” dia by 0.5” long. These UO2 pellets are encapsulated by a Zircaloy metal cladding 0.032” thick. The ceramic pellets are sealed inside the Zircaloy. There are 49 fuel rods in a fuel assembly package 7×7. The rods have a center to center spacing of 0.738” or a gap of 0.175”. There is about 40 kg of zirconium total in the fuel rod assembly. In a SFP, the fuel assemblies are put in vertically with their tops about 13 ft from the bottom and covered by a further 16 to 26 ft of water. Zircaloy is almost pure zirconium – ~95% zirconium Zr, 1.5% tin Sn, 0.12% iron Fe, 0.10% chromium Cr, and 0.05% nickel Ni. The Zircaloy thus has the properties of zirconium MWt 40: 6.5 g/cm3, 1855C MP and 4409C BP. When zirconium is oxidized by either O2 or H2O, ZrO2 is formed. ZrO2 is solid, ceramic like material with a 2715C MP. ZrO2 solids crack upon cooling from high temperatures. These reactions are rapid at temperatures above 1000C . It is important to realize that these reactions take place at the zirconium metal surface (not in the vapor phase as hydrocarbon or carbonaceous ordinary fires do) & there is no flame. The rate of reaction is controlled by the amount of O2 or H2O that can reach the metal surface. After Zr oxidation, a thin film of ZrO2 is formed on the zirconium surface which acts as a barrier to O2 or H2O from reaching unreacted zirconium. With this information, we can try to answer the two questions. Q1 how is H2 generated in SFP’s that have lost water? The answer is that for H2 generation, the spent fuel ponds must have boiled away (or leaked/lost) the water covering some of the fuel assemblies but all the water must not be evaporated! Only Zr reaction with steam H2O(g) can make H2. Zr reaction with O2 cannot make H2. If the fuel assemblies are ½ uncovered, the top half can be hot enough to react with steam by not cooled by water. The bottom half is still submerged in boiling water, which as it evaporates forms the steam to react with the portion of the fuel assemblies above the water line. Q2 Can the spent fuel rods catch fire, if dry, with no water & hot and exposed to air. The answer is no, not in the ordinary sense that we think about fires, with flames and combustion of hydrocarbon like material in the vapor phase being fed by convective air. Oxidation takes place at the zirconium metal surface by O2 diffusion which is slowed down by a film of ZrO2. However, over time, the oxidation of Zr (first by H2O) and O2 forms ZrO2. This film can be flaked away, or sloughed off exposing more fresh Zr. Remember that the Zr metal layer is only 0.032” thick. As the U2O and radioactive elements inside the Zircaloy cladding is heated to high temperatures by the exothermic oxidation reactions and by radioactive decay, the radioactive gases pressures inside the cladding will balloon out the cladding and can rupture it. The soft ZrO2 film can be pushed and flake away exposing the radioactive UO2 pellets. They have found radiactive material in seawater near the damaged plant. No big surprise. How much got there directly through fallout, and if there is a significant contribution from the water they have been spraying into the plant would be interesting to know. That would indicate the water is leaking back out. That won’t be known for quite a while. It is my understanding that BWR fuel rods are designed as pressure vessels in that they are filled with 3 bar of He gas. This improves heat transfer between the ceramic fuel and the Zircalloy cladding. Exposure to fission products and flux significantly changes the mechanical properties of the fuel and the zircalloy. Exposure to higher than design temperatures in the reactor or spent fuel pools takes the rods well beyond of design parameters. The question of condition of the fuel rods in the spent fuel pools will only be answered by direct examination some days from now. Hi guys, I have a quick question: Here is an official overview of radiation in Tokyo: http://113.35.73.180/monitoring/past_data.html Is this only excess radiation or does this include the normal day-to-day background radiation? I would assume so as there are values before March 11th, however these values appear massively small, e.g. 0.88 microsievert for an entire day — isn’t that really low? “Hundreds of employees from the Tokyo Electric Power Company, which owns the disabled Fukushima Daiichi Nuclear Power Station, worked through the weekend to connect a mile-long high-voltage transmission line to Reactor No. 2 in hopes of restarting a cooling system that would help bring down the temperature in the reactor and spent fuel pool. Someone on another blog requests clarification. Anybody? The world average background is about 0.27 microsieverts/hr. Japan has abnormally low natural background. 3-6 times less than world average from what I’ve seen. So 0.88 may be 10 times what was there before, but still only three times higher than world average, and some places in the world have 400 times or more higher than the world average, naturally. 0.88 microsieverts/hr. is of no concern. They are actually measuring in micrograys, so actually sieverts would be slightly higher. If you want to find out more about natural background, go to wikipedia or some other source. That is very good information, certainly improves my understanding of the Zr ‘fire’ issue. What does the introduction of seawater, with all of its ionic content, or boric acid do to the equation? Would it affect the passivation process, speed up or slow down the reaction, and what could be the source of the grey smoke? Your expertise is much appreciated. Not sure about the background calcs there William. My understanding is that typical natural background is around 2-3mSv per year which would equate to 5-9 μSv/day and 0.2 – 0.35 μSv/hr . So yes, 0.88 μSv per day would be very low. All I can say is wait for the final word (real life, unfortunate data) on the zirc water reactions in the spent fuel pools… I have struggled with that event explaination for unit 4 since the start. Most things I have seen require the fuel to still be critical after or just prior to a complete loss of coolant to generate the intitial temperatures to acheive the self sustaining generation of hydrogen from the cladding. Units 1 & 2 fit this description. I withhold judgement on unit 4 until all the facts are released…. I still believe all the hydrogen explosions came from primary containment vents via the secondary contaiment paths, or possibly secondary plant hydrogen sources (generator venting operations). Leo, is that your post or Arlin Peters over at Atomic Insights http://atomicinsights.blogspot.com/2011/03/stop-worrying-about-spent-fuel-pool.html ? Anyway, as I said over there, an interesting insight and the lack of generated combustion gas might explain the apparent lack of burning on the zirc rod demo. A different kind of burning, which may well hold implications also for the (reduced) transport of liberated fission products. I don’t know the effect seawater and its ions etc would do. Ditto on the grey smoke. However, liq seawater hitting hot fuel rods which have a ZrO2 film would quickly and violently vaporize. This may blow off any ZrO2 film and expose fresh Zr to further oxidation. Seawater salts would be deposited on rod surfaces and may help protect them, but that’s speculation. I’m curious of the take on this IAEA quote from today’s report. its the first time they’ve used the terms high beta gamma contamination levels. How does my 0.27 μSv/hr differ from yours. It is in the middle of your range. Remember we are talking self sustaining zirc water reaction producing hydrogen…. Not cladding failure and fission product gass or worse fuel pellet release… Cladding failure occurs at much lower temperatures as we have seen occur with this event based on the radiation release rates. I have no doubt there was zirc water reaction that occurred in the operating cores following the station blackout (loss of power) and their associated explosions in the reactor buildings due to vent operations and system leakage. But I am still not 100 % convinced about unit 4 due to the spent fuel pool, even with a full core off load recently done. All data I have seen was it was offloaded more than a week prior and cooled adequately prior to the event. I have not seen a positive confirmation that fuel pool level was lost enough to create the exposed clad steam environment required either for unit 4. This data will ultimately come out and all should learn from it… either way…. I think the IAEA considers 160 μSv/hr as a very high level, as do I. Not immediately dangerous, but if you remained in that area, you would be getting several times natural background each day. If you are inside you would reduce exposure by up to ten times depending on the structure. This is a spot measurement. If there were anyone living near there, they would remove them. Sorry William, you are quite right that our per-hour figures agree. The Tokyo figure as the original post gave 0.88 μSv per day is very low. I mean more than the yearly dose from natural background, each day. Assume 2400 μSv as the natural background yearly dose. So a little less than double that. Not something they are going to subject people to, unless there is no choice. I discounted that being a per day reading, and interpreted that as the reading for that day on a per hour basis. Now I see why he was saying 0.88 is very low. Impossibly low, which is why I reinterpreted it. Which is still low as an hourly rate. Without further data, and unless some other source can be suggested, structural guys at my employer think the grey/dark smoke is almost certainly high temperature concrete failure. An infra-red or false colour map of the buildings would be known and should be published. They’re referring to the 0.855 MBq/m^2 ground activity measurement from surface contamination taken along road 50 some 28 km from Fukushima on Sunday 1525 JST. This value (about 24 Ci/km^2) is higher than the Cs-137 contamination observed in some of the restricted areas around Chernobyl years after the accident and it accordinly exceeds values that would require evacuation. However, those thresholds are extremely conservative, you would only expect some 3 mSv as an extra yearly dose when living in that area. The activity will also come down by at least two orders of magnitude in a couple weeks when the most active radionuclides (I-131, I-132 and Te-132) decay. I don’t know what point of mine you are arguing, but recent posts of mine have talked about 160 μSv/hr, which I stated was high and 0.88 μSv/hr which I stated was low. Has anyone noticed that official reactor parameter status updates started to include the temperature at unit 2’s spent fuel pool! Temp was 49C at 08:30 Monday and 50C at 14:25 Monday. Given that they seem to have mentioned pumping 40t of water into this particular fuel pool in recent days, I wonder what the temp was before they did this. Oh and sorry that I didnt post this in the open discussion, but as it was status info for March 21st , I thought it was kind of on-topic, but maybe I made a mistake? The wroding I assume came from TNYT that I quoted earlier today does not appear in the print edition I just finished reading. Incidently, TNYT did commendably in that print article. Steve Elbows, on 22 March 2011 at 11:37 AM — On-topic, thank you. Must not be getting the winds other places are getting, allowing things to accumulate. Any news on whether this area has been evacuated? If so, mext really should show that on their maps. Every time an original failure of this system, or a barrier to recovery in the failed system is mentioned, it just seems obvious to me that the major problem in Gen I, II, III, and likely IV is that the system analysis and its effective recovery depends on consideration of only single point failures. This is a complete disaster. This is a highly volative system, with huge consequences of failure (noting that design standards simply define prob of a radiiation leak ) and a more appropriate design methodology would involve standardised and unit specific what-if scenario’s, markov chain modelling , propoper employment of conditional probabilities in the system/ sub-system availabilities, and consideration of correlated internal and external events in the design, testing, compliance and certification. These reactors are not home heating systems and should instead face the kind of analysis reserved for rockets ! Nitride formation in air and oxidation of U02 to U308 could become issues under dry conditions. The reaction in dry air is faster: it apparently has close to linear rather than quadratic kinetics, due to the formation of non-protective oxide (nitride) scales. And this is all my speculation – but for that scenario to occur there would likely have to be a near total loss of water in the spent fuel pool, and this doesn’t seem to have been the case, given the still apparently limited releases of fission products and the non-observation of activated zirconium in the limited CTBCO and KEK data that I’ve seen (someone put up links on this blog, a while back). Maybe tomorrow we could discuss what is the best case is for Fukushima? @ fusefiz: thank you for providing a plausible explanation for the hydrogen explosion in the spent fuel ponds! This fits perfectly with my model which says the fuel rods would not reach over 600 degrees C in any case when there’s a hole at the top to the outside air. Radiolysis occurs at room temperatures even, so that’s a highly plausible explanation. Thanks again for suggesting this! I’m confused about a possible contradiction with what we are presently told about unit 2 spend fuel pool. As I mentioned in a comment above, temperature readings from this pool have started to appear in official data as of Monday afternoon. But there are articles in the press today which mention an official called Hidehiko Nishiyama saying that unit 2 spent fuel pool may be around boiling point. I guess he is saying this because of steam in the area, but this raises questions about the data that has started appearing about this pools temperature. One thing the official data does show is that the temp is slowly climbing, now up to 53C at 11.20am JST Tuesday. News agencies such as Kyodo occasionally mention that seawater was pumped into number 2 spent fuel pool on Sunday. I also note that IAEA are trying to get more info about the common fuel pool as reports yesterday indicated that some kind f water spraying operation was said to have taken place there. I seem to recall seeing info a fe days ago that suggested temps in this pool were 60something degrees. No radiation release associated with the plumes of smoke. Levels remained constant. Power cables now attached to all 6 reactors. Checking for integrity prior to switch on may take until Wednesday or later. Yes, I had noted and mentioned that here earlier. The boiling reference may have been for unit 3 SFP. That one has had the most problems given the amount ot water they have sprayed into it. Still don’t know if it is actually boiling. That would be serious. Note that they say injected seawater into unit 2 SFP. That means they have a more normal way of getting water into there. Concerning the common SFP. I would not be concerned. That is far enough from the reactors, that they shouldn’t have much problem dealing with it. I was concerned about it last week, when information was lacking and they only had 50 people at the reactor complex trying do deal with all the problems. That was stupid in my opinion. The “steam” is more likely “fog”. Cold air blowing across warm water. SFP 2 is warm. The reactor building is open, though not completely destroyed like reactors 3 and 4. My own lay opinion on that was that with elevated levels of radiation they were concerned with running through their technicians, who would need to be permanently rotated out of the game, so to speak, as each was dosed up to near the 100mSv limit. I don’t think this issue has been discussed previously so I bring it up for comment by those who understand how this problem is managed. But there are articles in the press today which mention an official called Hidehiko Nishiyama saying that unit 2 spent fuel pool may be around boiling point. Nishiyama is the DD of NISA, a key nuclear safety agency official in the crisis, he does daily press conferences. I believe the only reasonable explanation for the Independent story is that they got their Tuesdays mixed up. Nishiyama had that concern on Tuesday LAST WEEK, March 15th , not today March 22nd. Water spraying has not been done to reactor number 2, because there is no access from the outside of the reactor hall (refueling floor). The only blowout panel that has popped out is on the east side above the turbine hall and you cannot get any fire trucks there. Seawater has been pumped to reactor 2 spent fuel pool through the fire fighting line (called “water injection”, whereas operations from the outside are called “water spray”). It’s possible this pumping is done with the reactor unit’s own Diesel-Driven Fire Pumps or with a fire truck. The actual work done would have involved reorienting the fire extinguishing system valves to feed the SFP. The fire fighting pipe system is a listed backup water source for the SFP (after the SFP make-up water line). Note “special vehicle” and “pour” verses the term “spray” used previously. That might suggest the implementation of the cement truck idea to pour water. But that report #24 link is incorrect and links to #23. I don’t know if you guys have seen the thermal images of the plants from yesterday. Can you guys comment on this analysis from CNN? KING:… Here to talk over the nuclear crisis Arnie Gundersen. He’s is a nuclear safety advocate who consults with the Vermont state government about the Vermont Yankee nuclear power plant. Mr. Gundersen, thanks for coming back. I want to draw your attention to these infrared images that we have received. The Japanese government put them out. I want to start with reactor one. These are infrared images obviously taken from above. You see here the casing in the reactor one building and you see the heat signature here, the yellow and red. In reactor one, the government says the Ministry of Defense says the highest temperature 58 degrees centigrade so about 136.4 Fahrenheit the government say, what does that image tell you? ARNIE GUNDERSEN, NUCLEAR SAFETY ADVOCATE: I don’t believe the highest temperature is anywhere near that. It’s probably much nearer to thousands of degrees, but — what it does show me is you’ll see sort of like a line, a straight line of hot material. I don’t know anything inside that nuclear containment that’s a straight line. It’s all curves. So it shows me that the geometry of the hot material is distorted. KING: What is that — if it’s been distorted, what that mean is happening inside? GUNDERSEN: It will be — it will be harder to cool it because it looks to me like the energy is not in the spot where it should be. Looks to me like it’s formed a long line and it’s not good, but I’m more concerned about some of the other reactor there. KING: Well, let’s close this picture down and move it over. I want to bring up reactor two. Now we don’t see as red hot here in reactor two as we did in reactor one. But the entire, you see heat in the entire building. This is where TEPCO has said there’s a possibility of a breach in the core self. What does this picture tell you? GUNDERSEN: Well, in the words that go with that the Ministry of Defense says that the containment vessel is at 262 degrees and that’s 50 degrees above the boiling point of water. That’s the containment vessel that’s believed to have a crack in it. So water cannot exist inside it because it’s at atmospheric pressure as a result of the crack. It tells me the suppression pool is likely dry, and that’s the one I would be most worried about, because it seems to me that what you’re seeing there is super heated air with no water in sight. KING: So, super heated air, a possible breach. What are the risks of trying to going and contain this to get in close what you need to do? NHK reports that during the periods of grey smoke yesterday/today, site radiation levels spiked to nearly 3000milliSV and personnel were of course withdrawn. When the smoke went away, levels dropped somewhat. I’ve just heard the BBC reporting Tepco are speculating the smoke might be from “oil” left by damaged equipment and that the very high rad levels are from a wind change. I think the only real explanation is that the fuel is moving/settling as the structures are collapsing. IIRC, the World Trade Centre Towers were discovered to have an expansion rate problem in the steel re-enforcement of the concrete. Update on my last post- the “Earthquake Report #24” link I reported as bad was removed. Thanks to everyone for their theories about these confusing pres articles that mention unit 2 spent fuel pool at boiling point. This is an article about and video of the cement truck they are using to fill SFP 4. Another story on this site talks about a water cannon truck they have brought in from Australia. Radiation levels in the sea around the plant are increasing. I suspect radioactive water is draining out of the plant, but could be just from deposition from the air. First I would have gone with simple “BS”. But to elaborate, this Gundersen has absolutely no idea what he’s talking about. The IR imaging measurements have no penetration. In other words, they measure the radiation at the LWIR frequency range coming off from the closest surface or less permeable gas mass and are unable to “see through” any walls. Even typical winter clothing (without military grade IR signature suppression fibers) blocks most of this spectrum from the covered skin surfaces. So what you’re seeing for reactors 1, 3 and 4 is the temperature of the refueling floor of the building some 30 m (100 ft) above ground. 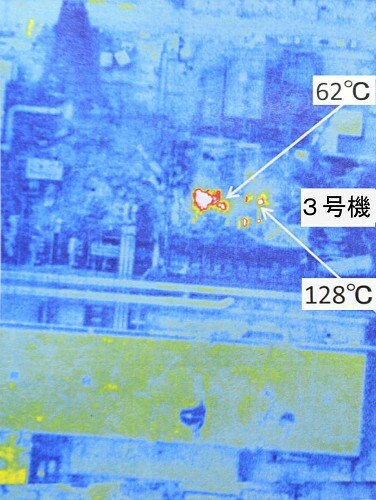 You cannot see the temperature of the reactor pressure vessel or the containment vessel from an aerial IR image like this. Any talking about other purported CV temperatures and comparing them to these pictures is worthless. The same goes for “circular geometries”. The fuel rods in the pools are arranged to a square geometry, but you would not expect their heat to be uniformly distributed even in a completely normal SFP, because there are rods of different activities from different refueling periods. I think the only value from these images is the estimations for the peak temperatures of the fuel pools (southeast quadrants of the reactor buildings, left bottom in these images). Image of reactor 1 is somewhat disconcerting, because the peak heat areas appear to be above the reactor pressure vessel proper and not the SFP. This could indicate leaks around the top shields or their circumferencial support plugs, but is inconclusive, since heat around the same area could come from other damaged equipment migrated there by the hydrogen explosion. This article also deals with the concrete truck used to pour water into the SFP of unit 4. The statement about Chernobyl having used the same type of equipment to pour concrete on that reactor may revive reports that they are going to do the same thing here. The only acticle I have found on that site about the smoke talks about microSv not milli. 3Sv/hr would be an extreme level. Please provide a link. What I found was 1,932 microsieverts per hour. Now this is 1 km west of reactor 2, and dropped within the hour. Levels at the plant would be much higher, but over 2000 times seems suspect. Barry has a new update on the main page of this site. He has already discussed the seawater measurements. New discussions should maybe be moved to the comment section of this new update. I am going to talk about the Iodine 132 levels there.